This weekend, when the next cargo resupply mission to the International Space Station lifts off from NASA Wallops Flight Facility in Virginia, it will be carrying among its supplies and experiments three cereal box-sized satellites that will be used to test and demonstrate the next generation of Earth-observing technology. NASA has been increasing its use of CubeSats — small satellites based on several configurations of approximately 4 x 4 x 4-inch cubes — to put new technologies in orbit where they can be tested in the harsh environment of space before being used as part of larger satellite missions or constellations of spacecraft. The three CubeSat missions launching on Orbital ATK’s ninth commercial resupply mission represent a broad range of cutting-edge technologies housed in very small packages. RainCube — a Radar in a CubeSat — is just that: a miniaturized precipitation-studying radar instrument that weighs just over 26 pounds. RainCube is smaller, has fewer components, and uses less power than traditional radar instruments. NASA’s Earth Science Technology Office (ESTO) In-Space Validation of Earth Science Technologies (InVEST) program selected the project to demonstrate that such a diminutive radar can be operated successfully on a CubeSat platform. This mission marks the first time an active radar instrument has been flown on a CubeSat. If successful, RainCube could open the door for lower-cost, quick-turnaround constellation missions, in which multiple CubeSats work together to provide more frequent observations than a single satellite. “A constellation of RainCube radars would be able to observe the internal structure of weather systems as they evolve according to processes that need to be better characterized in weather and climate forecasting models,” said RainCube Principal Investigator Eva Peral of NASA’s Jet Propulsion Laboratory in Pasadena, California. RainCube will use wavelengths in the high-frequency Ka-band of the electromagnetic spectrum. Ka wavelengths work with smaller antennas (RainCube’s deployable antenna measures at just half a yard, or meter, across) and allow an exponential increase in data transfer over long distances — making RainCube a demonstration in improved communications as well. JPL developed the RainCube instrument, while Tyvak Inc. developed the spacecraft. CubeSats can also be used to test new subsystems and techniques for improving data collection from space. Radio frequency interference (RFI) is a growing problem for space-based microwave radiometers, instruments important for studying soil moisture, meteorology, climate and other Earth properties. As the number of RFI-causing devices — including cell phones, radios, and televisions — increases, it will be even more difficult for NASA’s satellite microwave radiometers to collect high-quality data. RFI already affects data collected by Earth-observing satellites. To mitigate this problem, measurements are transmitted to the ground where they are then processed to remove any RFI-corrupted data. It is a complicated process and requires more data to be transmitted to Earth. With future satellites encountering even more RFI, more data could be corrupted and missions might not be able to meet their science goals. 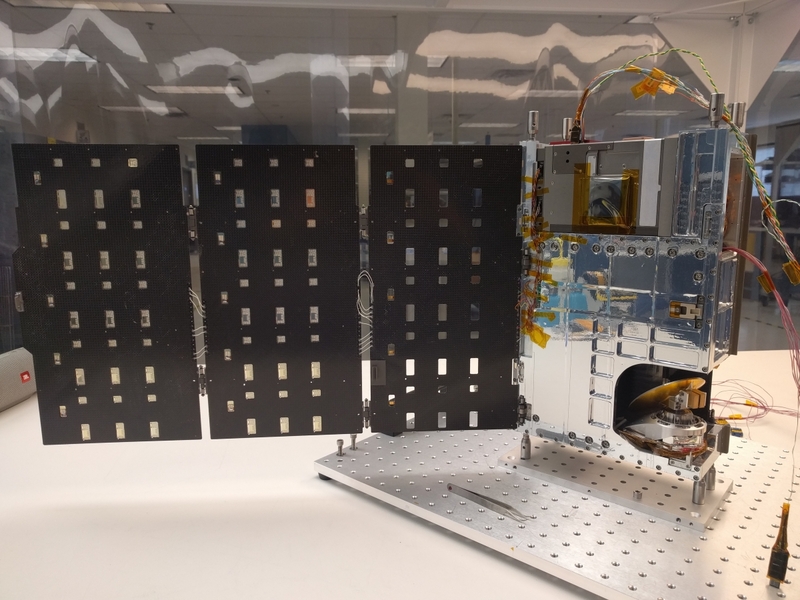 Johnson collaborated with technologists at JPL and Goddard Space Flight Center, Greenbelt, Maryland, to develop the CubeRRT satellite to demonstrate the ability to detect RFI and filter out RFI-corrupted data in real time aboard the spacecraft. The spacecraft was developed by Blue Canyon Technologies, Boulder, Colorado. One of the radiometer-collected weather measurements important to researchers involves cloud processes, specifically storm development and the identification of the time when rain begins to fall. Currently, weather satellites pass over storms just once every three hours, not frequently enough to identify many of the changes in dynamic storm systems. But the development of a new, extremely-compact radiometer system could change that. NASA’s Earth System Science Pathfinder program selected Steven Reising of Colorado State University and partners at JPL to develop, build, and demonstrate a five-frequency radiometer based on newly available low-noise amplifier technologies developed with support from ESTO. The TEMPEST-D(Temporal Experiment for Storms and Tropical Systems Demonstration) mission will validate the miniaturized radiometer technology and demonstrate the spacecraft’s ability to perform drag maneuvers to control TEMPEST-D’s low-Earth altitude and its position in orbit. The instrument fits into a Blue Canyon Technologies 6U CubeSat — the same size CubeSat as RainCube and CubeRRT. “With a train-like constellation of TEMPEST-like CubeSats, we’d be able to take time samples every five to 10 minutes to see how a storm develops,” said Reising. This would improve upon the three-hour satellite revisit time, especially when collecting data on tropical storms like hurricanes that can quickly intensify and change. RainCube, CubeRRT and TEMPEST-D are currently integrated aboard Orbital ATK’s Cygnus spacecraft and are awaiting launch on an Antares rocket. After the CubeSats have arrived at the station, they will be deployed into low-Earth orbit and will begin their missions to test these new technologies useful for predicting weather, ensuring data quality, and helping researchers better understand storms.